Size of this PNG preview of this SVG file: 450 × 456 pixels. Other resolutions: 237 × 240 pixels | 474 × 480 pixels | 592 × 600 pixels | 758 × 768 pixels | 1,011 × 1,024 pixels. English: Map of Europe showing NATO (blue) and the Warsaw Pact (red) ca. 1982. Português: Mapa da Europa com NATO em azul e o Pacto de Varsóvia em vermelho em 1982. English: This map is part of a series of historical political maps of Europe. All maps by Alphathon and based upon Blank map of Europe.svg unless otherwise stated. Deutsch: Diese Karte ist Teil einer Serie historischer politischer Europakarten. Solange nicht anders angegeben, wurden alle Karten durch Alphathon auf Basis von Blank map of Europe.svg erstellt, sofern nicht anders angegeben. Français : Cette carte fait partie d'une série de cartes historiques et politiques d'Europe. Toutes les cartes ont été créées par Alphathon et basées sur Blank map of Europe.svg sauf indication contraire. Between 1453 and 1832 there was no independent Greek state. During this period the region was ruled by the Byzantine Empire's Turkish successor: the Ottoman Empire. In 1806 the Holy Roman Empire was dissolved under French pressure. 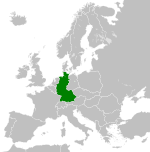 In 1871 the Prussian-ruled North German Confederation was united with the southern German states (except Austria; the so-called Lesser German Solution) to form the German Empire, the first modern German state. In 774 Charlemagne conquered the Kingdom of the Lombards. However, only northern and central Italy fell under Frankish control (nominally including the central Italian Papal territory). This northern portion later evolved into the Kingdom of Italy (following its partition from Middle Francia in the 855 Treaty of Prüm), and formed part of the Holy Roman Empire from 962. Other than a few periods of personal union with its southern neighbours, the north-south divide would remain until the unification of Italy in the 19th century. In 1805 Napoleon crowned himself King of Italy and subsequently created a client-kingdom in north-eastern Italy. While Charlemagne conquered the northern portion of the Lombard kingdom, the south remained separate, apart from a few periods of personal union, until the unification of Italy in the 19th century. As an single entity, southern Italy was sometimes united, sometimes not, during this period. While not a united polity, the County of Sicily and Duchy of Apulia and Calabria were both ruled by members of the House of Hauteville (in 1097 by Roger Bosso (uncle) and Roger Borsa (nephew) respectively) and were closely tied. In 1860 the Kingdom of Sardinia united almost all Italian lands into the newly re-formed Kingdom of Italy, and within the next decade the remainder of Italian lands not part of the Austrian Empire/Austria-Hungary, Switzerland or San Marino were also integrated. See also: Free City of Danzig – 1812 Officially the Kingdom/Tsardom of Poland in a personal union with the Russian Empire. Incorporated in a real union in 1832. Europe at the height of Napoleon's power. Europe following the Congress of Vienna, which restored much of the old order following the Napoleonic wars. A map of Europe circa 1973 showing NATO (blue) and Warsaw Pact countries (Red). Released under CreativeCommons Attribution-ShareAlike 3.0 Unported (http://creativecommons.org/licenses/by-sa/3.0/). Released under CreativeCommons Attribution ShareAlike (http://creativecommons.org/licenses/by-sa/2.5/). This page was last edited on 2 November 2016, at 01:13.